Two weeks ago, I had finished this design called, "Event Horizon" to find that the subject of Black Holes and that incredible, historic image was all over the news last week. My own "E.V." was inspired by both my NASA experience and also the 2014 Christopher Nolan film, "Interstellar". That film's beautiful vision of the fictional Black Hole, "Gargantua" was dramatically and accurately rendered courtesy of Nobel Prize winning astrophysicist, Prof. Kip Thorne. Yesterday, physicists claimed that Gargantua is remarkably similar to that actual image published yesterday by the Event Horizon Telescope. 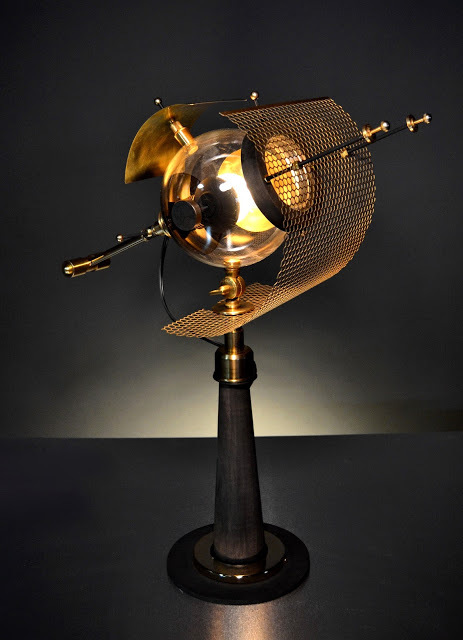 Now the specs: the "Event Horizon stands 24" tall and scratch-built from solid maple, bronze, brass and glass. The globe bulb is obscured front and back by a circular "veils" of bronze and the light echoes back and forth in the gold and glass reflections. An orbital kind of movement is nicely implied by the shield's different diameters and materials- Solid bronze on top and a hexagonal brass mesh in front. A forward trajectory pierces the glass globe like an arrow. Smoked gray maple. 24K plated brass and bronze. One-Of-A-Kind!